Target audience: People I support primarily. Anyone who wants to perf like a pro? There may come a time where you need to import an xml file given to you by a support person into Perfmon. This is so precise, targeted data captures can be made of the impacted system, or sometimes to baseline a system to know what good looks like. The xml file is a template that defines the performance metrics to capture and also sometimes time intervals, file format for the results file, etc. 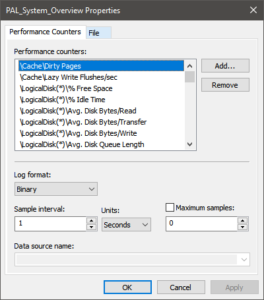 Step 2: Expand Performance and go to Data Collector Sets then User Defined. Step 3: Right Click the User Defined folder then select New > Data Collector Set. Step 4: Give it a name and leave the “Create from a template” selected. Click Next. Step 5: Click Browse and then select this file. Step 6: Click through the wizard (next/next) and then select the top radio button “Open properties for this data collector set“. Step 7: If you want to tweak anything about this collection, now is the time to do it. Most of the configuration has been done for you though. 200 MB rolling logs created in sequence with host name in the file name. This collects at a 1 second interval, to preserve space you can adjust to 5 or 10 seconds if you like. You do this by right clicking “Pal System Overview” under your data collector. Step 7: Once you are happy with the configuration, right click your data collector set and select Start. Step 1: Get the Windows Performance Toolkit, by way of the Windows Assessment and Deployment Kit. Since every iteration of the WPT happens to be distributed slightly differently than the previous version, I’ve included the MSFT guide on getting the most recent as a link. As it stands now, run through the web installer and uncheck everything but “Windows Performance Toolkit”. It is worth noting that the resulting Windows Kits folder with the WPT in it is typically portable. Meaning once you install, you can usually copy/paste the folder to another host without going through the web installer again. There are also redist executables to install just the WPT for ‘next time/next system’ as well. Step 3: Expand the “More Options” caret. Step 3a: Optionally I may have you skip this and click “Add Profiles…” and add a custom XML instead of check individual boxes. Step 4: Validate the Performance Scenario is “General”, Detail Level is “Verbose” and Logging mode is “Memory”. Step 5: Click “Start” and then reproduce the ‘bad behavior’. Step 6: Let the collection run for the amount of time I gave you (or a couple minutes) and then click stop. Zip and upload the resulting ETL file and the same-named NGEN.PDB folder (if present) to me.